It's ironic that my first post is a book that sat on my counter for more than two months. This book wasn't exactly worth the wait, but I'm glad I read it before I returned it. 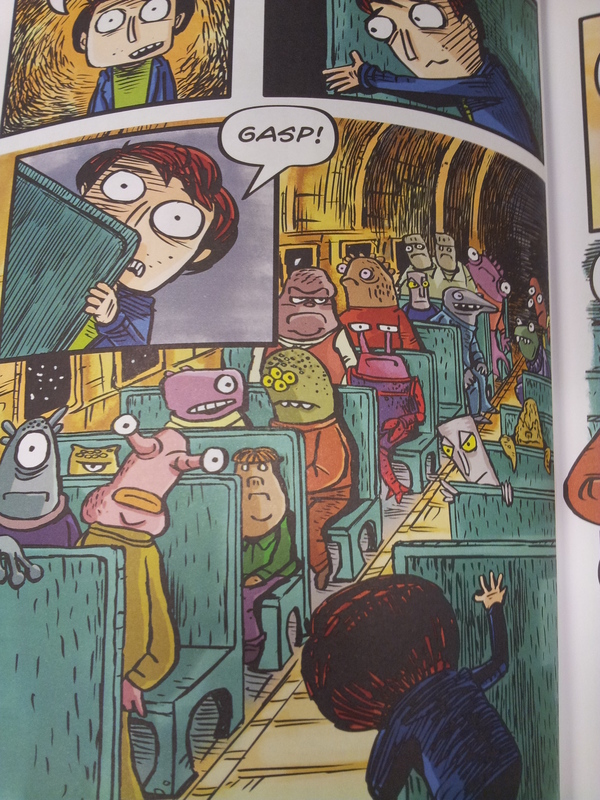 First day at a new school is one of my favorite tropes in children's books, and in this graphic novel it's given a twist as Bud misses the bus, or so he thinks until another bus arrives. The twist? The bus launches into space and takes Bud to his new new school, in the middle of space, far from Earth. This book uses a lot of simple motivations that work rather well. Bud wants to get home and with the help of new friends makes a plan on how to make that work. The principal, and many of the space races at the school, fear and hate earthlings. The conclusion is satisfying and ends a lot better than I thought it would.